If it isn’t enough that my children—thanks to XM radio’s 80’s on 8—think that Beat It and Come on Eileen are current radio hits, add to that my insistence on exposing them to the child-rearing of the Huxtable family and let’s see what we have here. Kids who live in a time warp of one-hit wonders and family togetherness? Check. Kids who maybe shrug their shoulders and list Bon Jovi in their top three favorite singers list? Check. Kids who ask their friends if they’ve seen the one with the Gordon Gartrell shirt and look puzzled when their friends walk slowly away? Check. “But why the Huxtables?” you might ask and not the Bradys or the Keatons or the Seavers or, gasp the Duncans. Well, if you’ve heard of every one of these families EXCEPT the Duncans, I think you already know why. 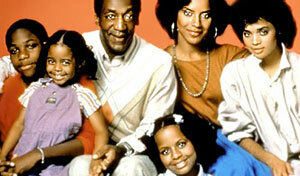 Because I trust Cliff and Claire Huxtable, that’s why. And it isn’t that I don’t trust the earthy Keatons or the well-intended Bradys or the having-it-all Seavers. It’s that my kids trust the Huxtables, too. And I’ve figured out why. First, they’re funny. And I mean witty funny, not Dad walks into a door funny the way tv shows nowadays have funny dads. Heathcliff Huxtable had some funny things to say, and a put-down-your-i-phone-and-watch-this-show-with-your-kids-funny way of saying them. My kids laugh at his antics, at the things he says, at Claire’s I’m-gonna-teach-you-thing-or-two-abut-life face. And not only do they laugh and laugh and laugh, but they are interested in the lives of every character. It is a tribute to this show that my kids sit quietly and listen to Cliff’s parents reminisce about World War II alone on their sofa on their wedding anniversary with nary a sassy kid in sight. It is a tribute also that when Cliff tells Vanessa he trusts her, even after her friend lights up a cigarette in Vanessa’s bedroom, I let out a sigh of relief. I don’t know if I would have done that, I think to myself. But I see now it was the right thing. And making her play a drinking game was both the right thing AND the funny thing. And they are creative together, this family—emptying out Theo’s room and turning the house into The Real World Apartments, lip-syncing Ray Charles, and schooling their children in music and history, and morality all at once. And nevermind that Stevie Wonder shows up, or that the quality of Phylicia Rashad’s fury should have had its own category for an Emmy, this show gets it right for many reasons. But the one that appeals to me most in these days of kids growing up too fast, of quick and sassy sitcoms where the parents are mostly bumbling through their own lives, serving only as entertainment and the occasional best friend to their kids—it is that these parents are real-deal parents. They are teachers and mentors, and cheerleaders and disciplinarians and historians, too. They are people—bright and complicated people with a sense of humor that draws all of us to the sofa to watch and see what will happen. So, I’ve turned off modern-day tv for my kids and I can’t say I’m not hoping just a little bit that the next time my kids ask yours if they’ve seen the one where Cliff pretends not to be a doctor at the car dealership, no one backs slowly away. Maybe they lean in. Maybe they’ll laugh about it together—maybe they’ll even know that Sinbad was the car dealer. You just never know.